What's Your Budget? WYB takes a look at some of the best bathroom vanities under £150. 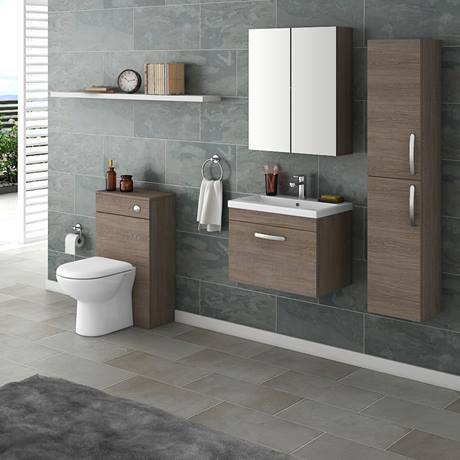 Will you choose wall hung or freestanding units to add style and practicality to your bathroom? Posted By Alan, 10th Aug 2017. 6 Minute Read. A couple of decades ago, the thought of placing a vanity unit in a bathroom hadn’t crossed the minds of the masses, however roll on into the year 2000 and if your bathroom doesn’t have a vanity unit it really isn’t complete. Buying a vanity unit should be a simple task, but when you have multiple varieties and endless styles it can sometimes feel overwhelming. The good news is our WYB team are back and in this week’s ‘What’s your budget?’ feature we’re narrowing down your options by looking at bathroom vanity units under £150. Bathroom vanities, also known as vanity units, are storage cabinets for bathrooms which allow you to safely store essential bathroom products and accessories. They can be freestanding (floor standing) or wall mounted and come in a wide range of sizes and styles. Some bathroom vanities include basins and, if you have a small bathroom, you may be happy to hear that there are combination vanity units which combine a vanity unit, basin and toilet; perfect for saving space when it’s limited. There are no rules to buying vanity units so choose one which you prefer. Wall hung vanity units require a little extra effort when it’s time to install one, but they’re great for reducing crowding in smaller bathrooms by minimising the amount of floor space used. Freestanding vanities are the easiest to install and can also be moved around with ease, should you want to. 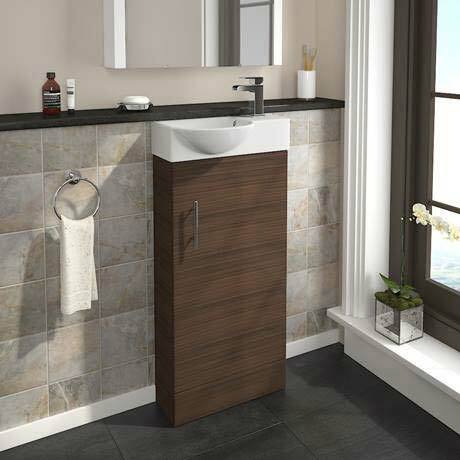 Slimline freestanding vanity units are perfect for smaller bathrooms and cloakrooms if you don’t want a wall hung unit. Don’t be surprised to see these units priced over £2000 - like this stunning Bauhaus Waldorf 1500mm Wall Hung Double Vanity Unit for example. Bathroom vanities are incredibly fashionable and practical which makes them very popular. On a positive note, they’re also offered in a wide range styles and prices which means you’ve loads of options with a £150 budget. As always, these bathroom vanities are in no particular order, but we’ll explain why we’ve chosen them and why we think you should consider them in your bathroom or cloakroom. The Cove vanity sink and unit is ideal for almost any bathroom. It is large enough to store the typical essentials and accessories of a modern family and has soft closing doors to add comfort. 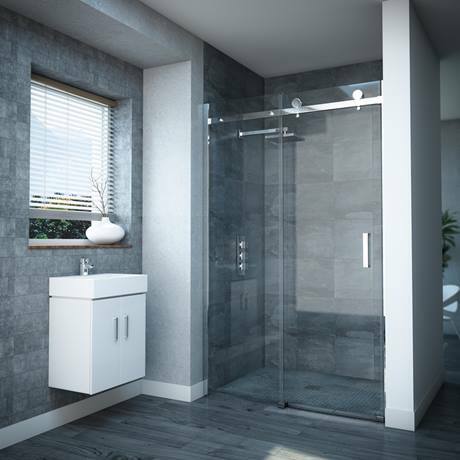 The white gloss finish provides a stylish look whilst the chrome furnishings add a sophisticated touch which is neutral, perfectly complementing a wide range of bathroom fittings. What could you buy with the change? There’s plenty of change remaining from a £150 budget so why not put this money towards this beautiful Pablo Modern Basin Mixer? The ultimate space-saver, Our Valencia mini vanity unit is a stylish slimline unit finished in walnut. Designed to maximise space in a cloakroom or ensuite, it’s also great for adding additional storage to small bathrooms too. If you want something slightly larger for a bathroom take a look at this wider unit with 2 doors. These small vanity units are ideal for keeping a small space tidy, which in turn helps reduce clutter and prevent it from looking small and crowded. It features soft closing doors for a gentle, quiet close. What could you buy with the change? The money left over from your vanity unit budget will quite easily pay for some cloakroom basin taps and waste. The Cast Mono Basin Mixer Tap would complement this vanity unit perfectly and comes with a free waste. The Brooklyn wall hung vanity unit is finished in mid-oak and features a single drawer for neat and tidy storage of essentials. This stunning bathroom vanity unit features a soft closing drawer which prevents loud bangs and is styled with a realistic wood effect texture to give it a luxurious look. Alternatively, if you’re looking for a floor standing option then take a look at this unit. What could you buy with the change? We’ve not been over budget for quite sometime and although this option does go over slightly, it’s a stunning option and worthy of stretching to! Space in bathrooms is becoming increasingly less so we’re always trying to find ways to make use of the space provided. 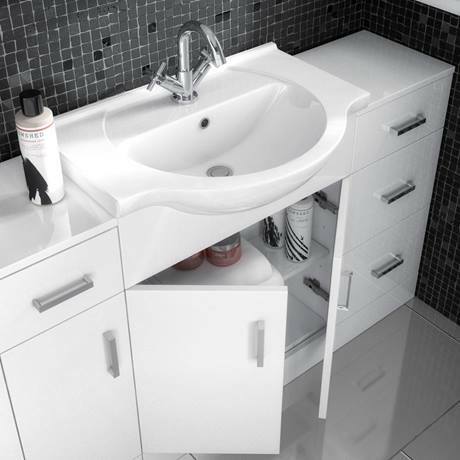 One of the best areas to use is corner space, that’s where a corner vanity unit comes in handy. This freestanding vanity is finished in white gloss making it ideal for almost any setting. It features 2 doors for extra practicality and chrome handles for a modern look. What could you buy with the change? Okay, so there isn’t a great deal of change from your budget, but the amount of space you’ll save is worth so much more! Last but certainly not least is our Nova wall hung vanity unit. This is one of our most popular bathroom vanities and when you view it, it isn’t hard to see why. Featuring 2 cupboard doors, which are soft closing for additional comfort, it offers tons of storage. The gloss white finish has a modern feel which would work perfectly in lots of bathroom designs. What could you buy with the change? You’ll probably need a new basin waste and tap so you could put the rest of your budget towards these. This vanity unit requires an unslotted basin waste. As we’ve seen, there are cheap vanity units and bathroom vanities which cost a small fortune. Working with a £150 budget will still give you plenty of options without you having to sacrifice on both quality and style. 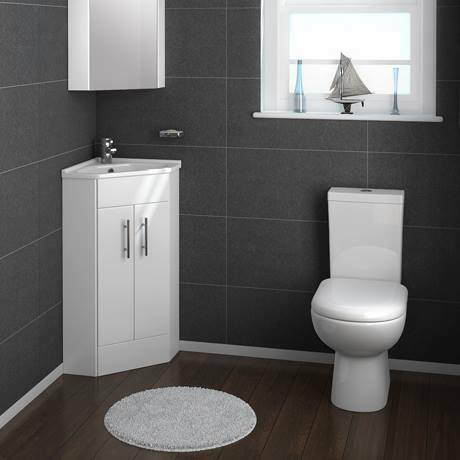 Make choosing a vanity unit even easier by selecting either wall hung or freestanding units. This will help reduce the number of options at your disposal. If you have a large bathroom then you’ll more than likely want to have standard sized bathroom vanity unit, but if space is limited then consider space-saving designs such as the small slimline vanity units or corner vanity units. Finally, once you’ve decided on something for your bathroom, here’s a helpful guide on how to install a vanity unit which you may find useful. We hope you found this segment of ‘What’s your budget?’ helpful and believe it will certainly help you find the best vanity unit for your bathroom. If you think this will help others then please feel free to share it with friends or on social media. Discover the secrets to creating a stunning traditional bathroom in your home. VP customer Emma from Lancashire has been kind enough to share pictures of her brand new bathroom.